On 6th January I set out on the 9.34 train to Waterloo and made my way from there by tube to Old Street. On the tube train I found a purse that someone had left behind, so I handed it in at Old Street station and then tweeted the name on the debit card it contained, in the hope of reuniting it with its owner. It felt good to be doing a small act of kindness on the way to the chapel of one of the kindest men this nation has known. The day was cold and I was chilled through when I arrived, so I sat in a pew next to a radiator and looked up at the pulpit from which, according to information I later found in the museum, Wesley himself had preached. The building itself is very beautiful with marble pillars, ornate carvings, stunning stained glass windows and elaborate gold decorations on the white walls and ceiling. 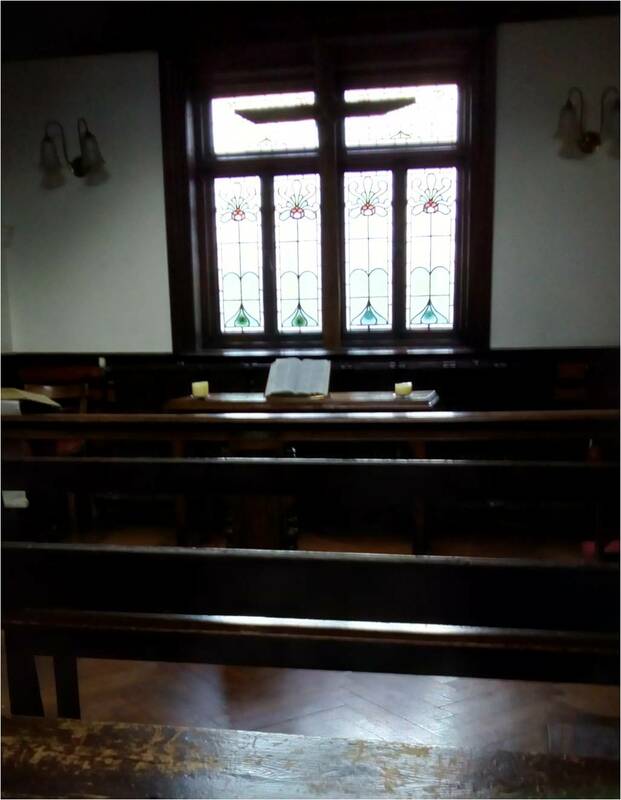 The Methodist chapels I visited in childhood, such as the one where my grandfather was the minister, were marked by their plain simplicity, and I was not expecting quite such a contrast. As I sat facing the pulpit and taking in the sight and atmosphere, male voices suddenly broke into a rendition of Charles Wesley’s hymn, “Come, Thou long-expected Jesus, born to set Thy people free”. They were in the balcony above and behind me, out of my sight, and it felt as if an angel choir had gathered to remind me of my purpose in being here – the pursuit of Jesus and establishing a deeper walk with Him. There was plenty to see and do, but I felt like a worshipper, not a tourist and I just wanted to sit for a while and soak up the atmosphere, worship God, and bring my prayers to Him. I told Him I was here because I wanted to put a stop to the gradual drift away from Him that had been going on for some time now, and for 2017 to be a year of drawing near again. It was lovely to have a leisurely day when I could take all the time I needed to be in His presence and be present to Him. I walked around the perimeter of the chapel, looking at the detail of each stained glass window and reading all the In Memoriam inscriptions. I was surprised to find a window sponsored by Methodist Freemasons, having always believed Christianity and Freemasonry to be incompatible. But how sad that, by the end of the day I had found seventy-eight memorial plaques and windows, but only seven of these mentioned women, and three of those only as a footnote to their husbands’ inscriptions. Considering how much the advancement of the kingdom of God in this country owes to many generations of the women of the Methodist movement, women like my grandmother, a Methodist minister’s wife who devoted her life to prayer, ministry, hymn writing and acts of kindness, I wondered if their contribution is really as little esteemed as this might suggest. 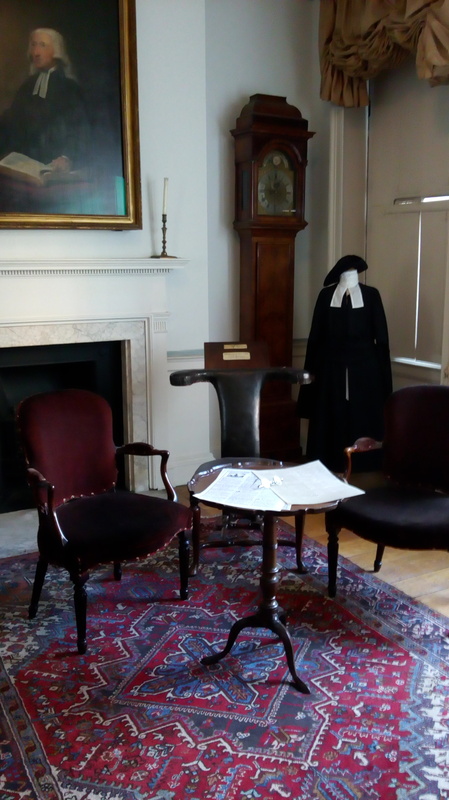 I was then invited to join a tour of the house where John Wesley lived and died (though in life he was, of course often away from it – he rode a total of a quarter of a million miles on horseback the length and breadth of this nation to preach the Gospel). I saw his Christening robe, clerical garb and shoes and was surprised at how small he must have been. There was also a rattle he played with as a baby, and a Wedgwood teapot with two prayers written on it. 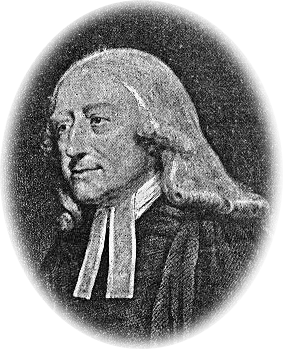 But, unknown to Josiah Wedgwood when he made the gift, John Wesley did not approve of tea drinking, and it would probably only have been used for home-made herb teas, made from garden herbs such as sage. I was fascinated by the writing case he took with him to write his thousands of sermons and hymns while on horseback. It was quite compact and would fit comfortably in front of him, with a sturdy, level surface on which to write. His travelling chest was surprisingly small – clearly he travelled very light. Some of the objects in the house gave a feeling of real connection with the man – the kitchen table and dresser were the ones used here in his time. There was a leather chamber horse (a replica of his own), to be bounced up and down on for twenty minutes a day when the weather was too inclement to go horse riding out of doors! 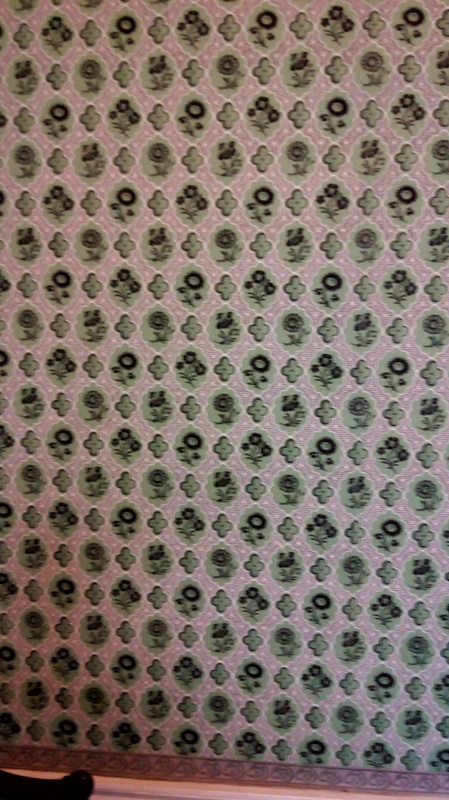 At some time in the past many layers of wallpaper had been peeled off the walls until the final layer, Wesley’s own wallpaper, was reached. Exact replicas were then made for each of the rooms, so they are now decorated exactly as in his time. 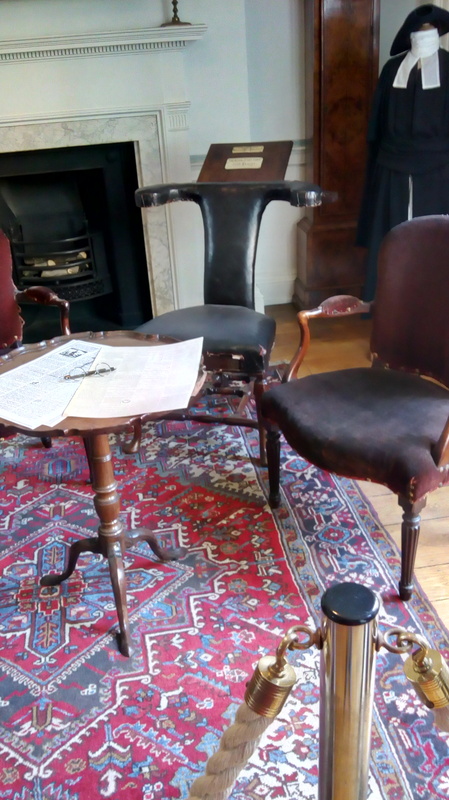 This part of my visit felt more touristy – I felt the same frisson when I saw his study with its writing table as I feel whenever I visit Jane Austen’s house and see her writing table (the two being very similar in size and shape). 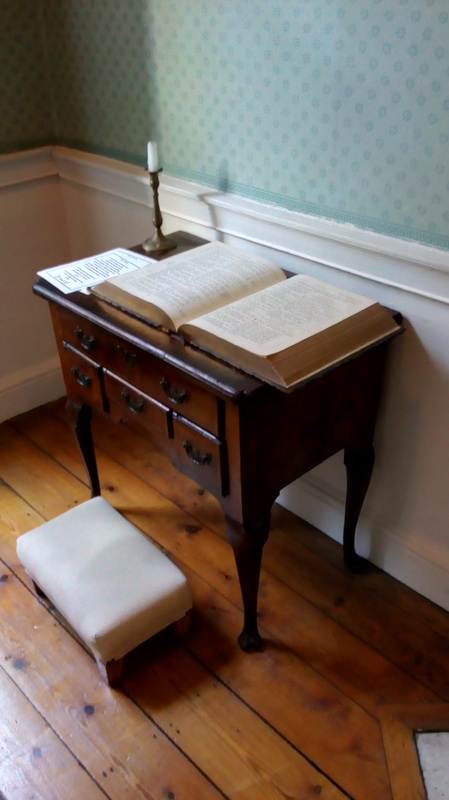 But the spiritual intent of my visit rushed back over me when I stepped into his prayer room and saw the low dresser with a big Bible spread on it and the little kneeler before it – no chair to sit in here; this was a room for knee-work. The sense of God’s presence was palpable, as if the walls were saturated with the many, many prayers that had gone up from this room. After leaving the house I visited the original Foundery chapel where I was happy to find the lectern Bible open at the very chapter I had read before leaving home that morning. 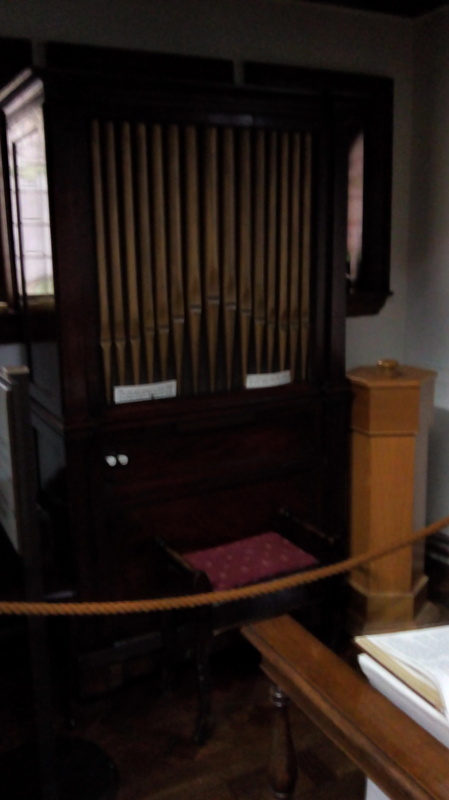 I was delighted also to see Charles Wesley’s own pipe organ. 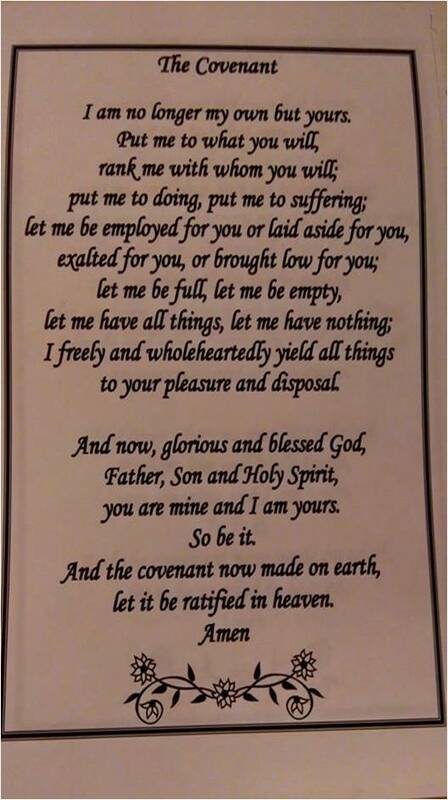 The words made me think of Jesus, who emptied Himself for our fullness, and of Paul’s words about “having nothing, yet possessing all things”. With much to ponder on and much to aspire to, I returned to the chapel to spend some more time in silent contemplation. As I sat down in the pew, a pianist began to play “It is well with my soul” – which seemed a fitting end to my visit. I loved how my time in the chapel had begun and ended with hearing worship in song. Our pastor read the words, and at one point, as he explained what they meant he became quite overcome with emotion. We were invited to take the microphone and say what in this song had particularly spoken to us. As I looked at the words, the line that leapt out at me was “I know how fear builds walls instead of bridges”. I couldn’t help but think of the very scared little man who is about to assume leadership of the biggest western nation, and his threats to build a wall to keep Mexicans out, as well as his intention to expel all illegal immigrants and ban Muslims from entering the country. I stood up and tried to explain this to the congregation – how one of Trump’s advisors, Monica Crowley, had tweeted a photograph of herself beside the Berlin Wall with the words, “At the Berlin Wall last week. Walls work.” That the trauma of separation caused by the wall, not to mention the oppression that took place behind it and the deaths of those who tried to escape its tyranny, should be seen as evidence that “walls work” should sound a note of the greatest alarm. And this reminded me of the situation in France during the 18th century, when the increasing wealth and complacence of the rich while callously grinding the faces of the starving poor had spilled over, in 1789, into the French revolution, which not only overturned the establishment and the stranglehold on power of the monarchy and nobility, epitomised in the storming of the Bastille on July 14th, but often at times descended into a chaotic bloodbath, with the introduction of the guillotine. I noted that social conditions in Britain, especially England, at the time were almost exactly parallel to those in France, and that it has often been said that what saved England from a bloody French-style revolution was the spiritual revival that took place under the Wesleys, George Whitefield and Charles Finney. And it struck me, pondering on the words of this hymn, that a few hundred sermons, preached here and there all over the country as John Wesley rode the length and breadth of the land, could not of themselves have been the bulwark that held back the tide of revolution and averted disaster. (Note: that is what I said in church; I have since learned that John Wesley delivered some 45,000 sermons during his ministry.) Rather, it must have been the many individual lives, transformed by the power of God, who returned to their communities and lived out the kingdom of God in their small, daily circle, that changed the history of the nation and brought about a peaceable change that, in the coming generations, could give rise to men like William Wilberforce and the eighth Earl of Shaftesbury, and women like Elizabeth Fry and Josephine Butler. This reminded me of Jesus’ saying that “a little leaven leavens the whole lump”. All it needed, in the Wesleys’ day, for revival to spread and transform the life of the nation, was for individuals indwelt by the Holy Spirit, to bring the kingdom of God into the homes and streets where they lived. And the same is true now. We might look at some worrying trends on the political stage here and abroad, and feel helpless to do anything about it. But that is not the truth. We are the leaven, scattered throughout the dough of society, which can leaven the whole lump, if we determine to bring the light and love of God’s kingdom to the places where we live and work. After church, our pastor spoke to me. He agreed with my analysis of the situation, and said that the parallels were even greater than I realised – that if I read the history of the South Sea Bubble I would see similarities both with quantitative easing and the bank bailouts which had been done at the expense of the poorest in society, and with the recent exposure of tax avoidance in offshore funds by some of the nation’s wealthiest people. 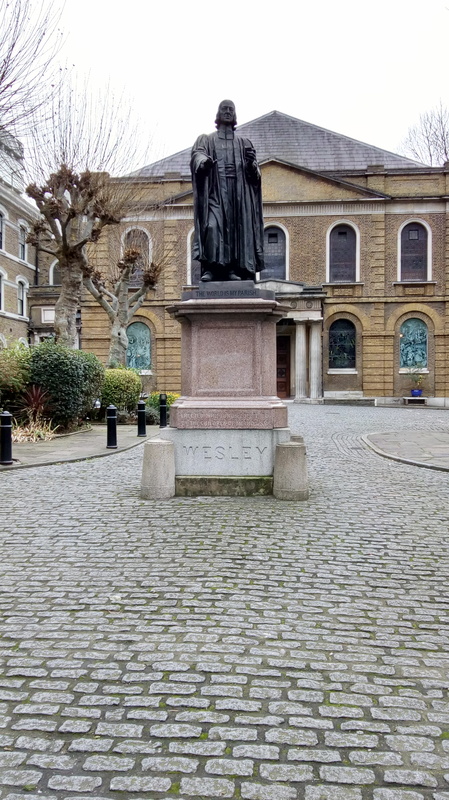 And he told me that it was estimated that twenty-eight thousand people came to faith in Jesus through John Wesley’s preaching – not a great proportion, considering that the population of Great Britain in Wesley’s time was around twelve million. A little leaven leavens the whole lump. If 2.3% of the population in Wesley’s time could change the course of the nation, what might we do today? We have the power in our hands to change the world, if we only realised it and prayed and acted accordingly. And somehow, as I sat contemplating all this, I felt God calling me to make a journey, both spiritual and physical, this year, in the footsteps of John Wesley. I spent some time researching places he had been. 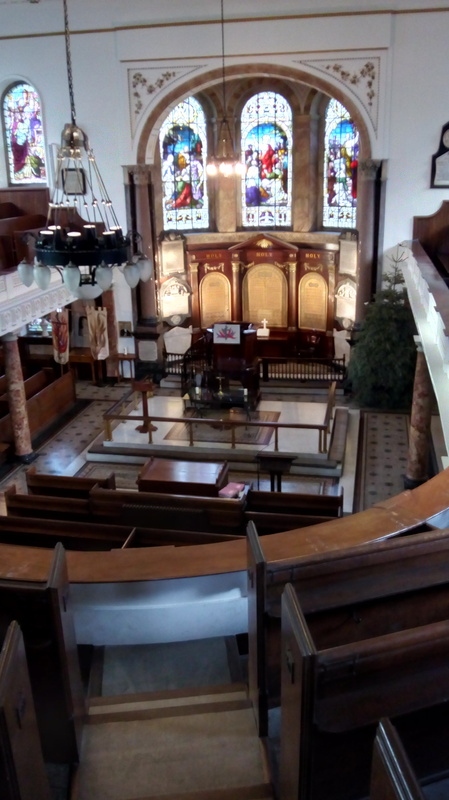 Some I already knew quite well – I had long been familiar with some of the sites in Cornwall where Wesley had stayed and preached, and I had often worshipped at Truro Methodist Church. My own grandfather on my mother’s side had been a Methodist minister, for a long time active in the circuit in East Hull, and pastoring at one of its churches. But I felt compelled to learn more about the Wesley brothers and their ministry, and in particular the secret of how they kept alive the flame of their relationship with Christ through a lifetime that was certainly not without its privations but which never wavered from devotion to the cause of Christ, the spread of His kingdom, and seeing lives transformed by His love and grace. Over the course of the year, I hope to chart my progress here.